We’re changing things up a little this week here at ItsAllTrue. I’m kicking off this Monday morning with a review of the first 30th Anniversary Masters of the Universe figure: Fearless Photog. He’s a pretty fitting start to celebrate the uniqueness that is 30 years of MOTU. Photog is another one of those MOTU characters that I never expected to get a figure. But Scott has surprised me once more, and I’m actually really happy we’re getting him. I’m one of those fans that believe MOTU can be home to various genres. I’m a fan of sword and sorcery, but I love how MOTU takes it a few steps further. Eternia is truly a world without boundaries, and I think it should maintain that freedom even if it means we pick up the odd character here or there. Photog’s overall body design is fairly simple. 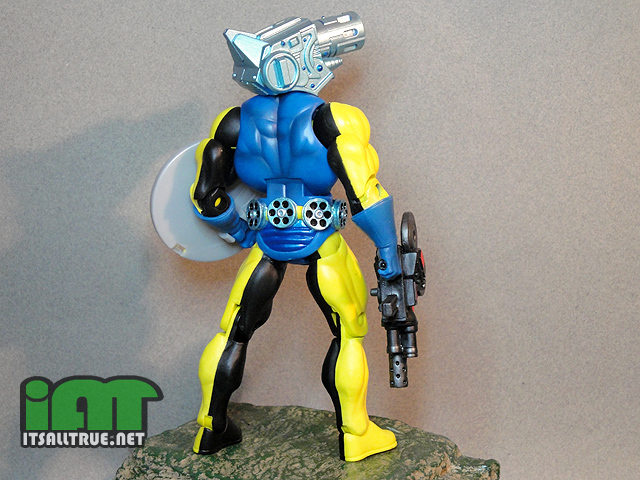 While the arms and legs are familiar pieces, his chest is a newly sculpted piece that has a shorter yet wider neck, and a rectangular indention to house his sticker. His belt/crotch piece is also new and displays small film reels all the way around. 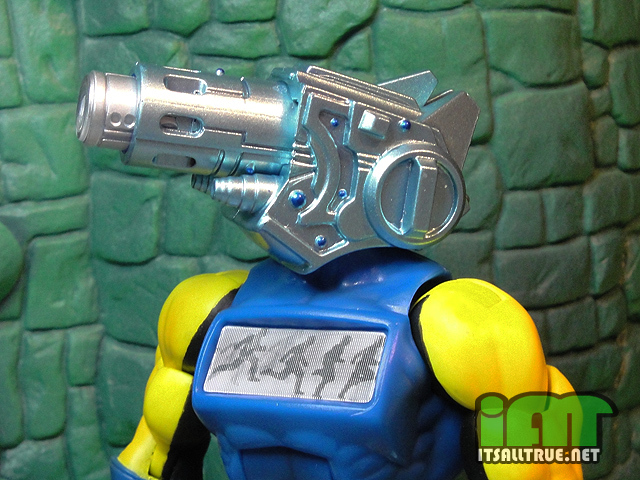 I’m guessing these are ammo cartridges for his gun, but in MOTU they could just as easily be a funky belt. 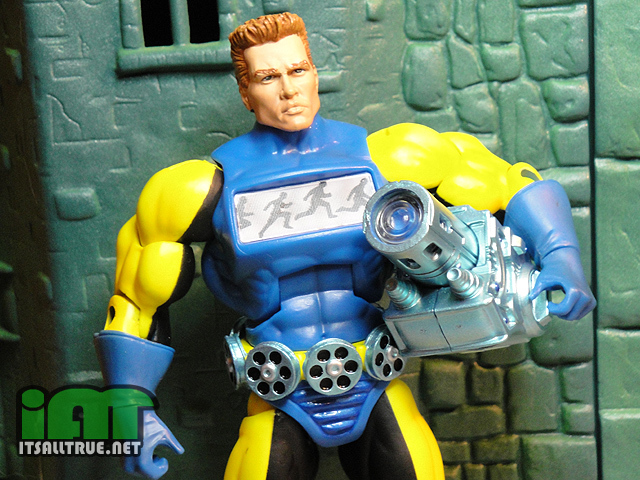 The sticker on Photog’s chest is lenticular and displays an animation of a man running, which is supposed to be a recording of his foes as they are defeated. This brings two questions to mind. Does Photog ever fight women? Also, why’s Photog have to be such a jerk? It’s bad enough that Whiplash and Clawful don’t really stand a chance against any competent adversary, but to photograph their failure and play it back to them is a plain dickish move. Photog’s most complex sculpt is his head. The 4 Horsemen did a fantastic job here. I’m not sure if they were going for this, but the first thing that pops into my head when I look at this piece is that it’s a camera designed by Jack Kirby. With all its oddly shaped buttons and panel, and plenty of sculpted circuitry lines making angular trails, it’s definitely easy to see Photog popping out of a Boom Tube from New Genesis. The camera doesn’t just look cool either. It also has the ability to “zoom” in or out by means of the fin on the back of his head. FP looks cool… I wanted to get him but money is really tight right now. I will try again on the Bay or Amazon later on if he doesn’t become too pricey. I swear that shield looks like it belongs to MoLarr. It looks like that old school dentist lamp they would shove in your face. Great review and pics, as always! So pleased to be having this figure after a 25-year wait. Being able to wait a decade or two to get my hands on some toys is paying off. The Four Horsemen certainly did this guy justice. When I saw the artwork for Photog back in the old MOTU magazine, I thought the yellow bits on the outside of his limbs were just comic-book-style highlights, and that his limbs would be all black. Looks sharp as it is, if a bit too close to Sy-Klone. What if Photog’s display of defeats is a by-product of the enegy-draining process? As photos display captured light reflected off a target, and IR imagery displays captured heat radiating from a target, perhaps the photog emulator takes the drained foe’s power and forms an image from it. Also good for pyschological warfare if you have a record of your wins. Or becoming a half-machine monstrosity just turned Photog into a colossal jerk. Now, if only they’d open the Design-A-Character contest to foreign people, as well, I’d be all over that like flocking on Moss Man. Where or what was I doing back in the 80’s were I missed this contest????? My ideas for create ring a figure would have been 10 times better then this design. Mattel gave away $100,000 for nothing. I’m not a hater but this figure is so LAME & on top of that I purchased 3 30th Ann. subs. Man you must know I’m a true MOTU die hard fan. Excellent review by the way!!!! You mean Scott’s Deadpool rip-I mean, /HOMAGE/, “SpecTor” or Geoff’s “Sir LaserLot” or whatever they’re called? and didn’t Drew have a (legal?) fight to get his contest winnings? 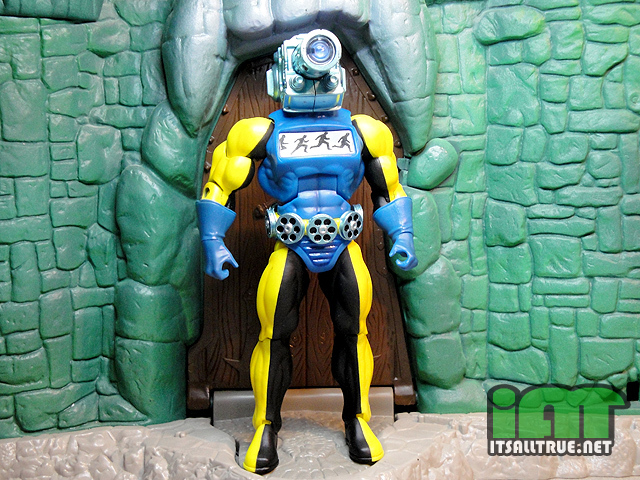 and then this figure only happened because of the recent resurgence of MOTU popularity AND the anniversary. It ain’t worth it, any way you slice it. the notice of photogs dickishness made me laugh. thank you vault. did anyone else see Cornboys wife’s review of photog on fb?